A lovely fat quarter bundle of Astor Manor arrived! I ordered it as soon as I saw it up on The Fat Quarter Shop site. Beautiful fabric! I also picked up a copy of Fat-Quarter Quilting by Lori Smith - what great little quilts ... now to decide which one to make first. (I jump between projects alot). I love this quilt! 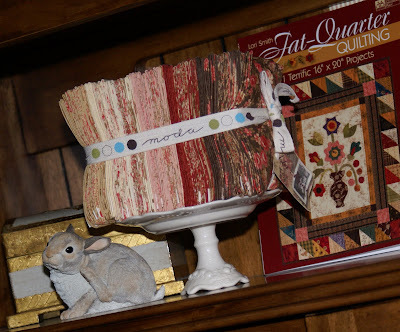 Is it from the book fat quarter quilting in the above picture? Did you cut out all the circles yourself? Beautiful color choice. Deanna from Washington. The quilt is gorgeous! It looks so rich and elegant. 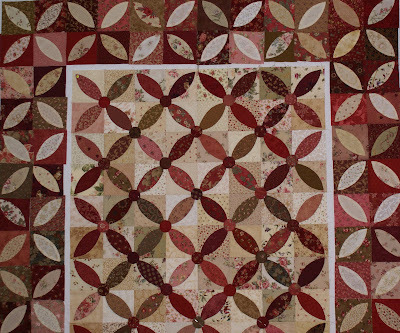 Love the quilts you have done, especially the New York Beauty. 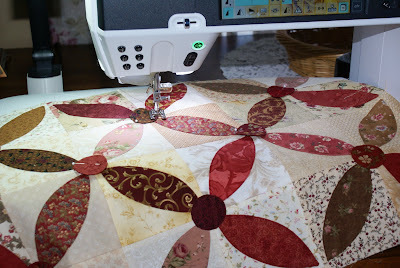 I really want to try one some day, most of my quilts are applique,however. I also have lots of projects going at the same time..I'm one of those who has many tops and not too many quilts..
What a lovely Blog. It really gives me a warm feeling. I adore your roosters! The orange peel quilt looks lovely. I'll be back! I love the Orange Peel quilt! Can't wait to see it completed! This is very pretty .... are all those circles for the orange peels in the border?